Olathe KS, September 14, 2016 – Castle Creations Inc., the leader in electronic speed controllers (ESC) for radio controlled (R/C) car, air, and multi-rotor hobby markets, as well as commercial UAV and drone markets, is excited to announce the release of the brand new, high performance, DMR 30/40 ESC for use in high performance and demanding applications such as FPV racing drones, battle drones, large camera carrying multi-rotors, and heavy lift multi-rotors. Loaded with features, the DMR 30/40 boasts an impressive power to weight ratio and is ready to fly right out of the package. The DMR 30/40 is controlled by Castle’s innovative Multi-Rotor V5 firmware released in July of 2016. The Multi-Rotor V5 firmware includes Castle’s proprietary Adaptive Timing SystemTM (ATSTM) which maximizes efficiency and power output across the entire throttle range and results in increased flight times and noticeably more torque. Released in July 2016, Multi-Rotor V5 firmware is a free upgrade to existing multi-rotor products and available for download through Castle Creations’ website, www.castlecreations.com. speed controllers (ESC) for unmanned aircraft systems, is excited to announce the release of a brand new, state-of-the-art and feature rich firmware, Multi-Rotor V5, for FPV racing and multi-rotor drones (UAV’s). Castle Creations’ ESC’s are designed for use in high performance and FPV racing and multi-rotor drones and have a unique Adaptive Timing System to maximize efficiency and power output across the entire throttle range, increasing flight times and maximizing power. Multi-Rotor V5 features an extremely fast throttle response and allows for very high throttle input frequencies, resulting in increased vehicle stability. When FPV racers upgrade to Castle Creations’ new, industry-leading Multi-Rotor V5 firmware, they will experience thrust, precision and agility like never before. Multi-Rotor V5 is a free upgrade to existing CastleLink software users and available for download through Castle Creations’ website, www.castlecreations.com. High Maximum electrical RPM (300,000 eRPM) – a must have for FPV racers! Low Latency Throttle Response – provides better stability and control! Very Linear Throttle Response – improves “feel” in flight! Active Braking – quicker throttle response when decelerating! Programmable via Castle Link USB Adapter – the Castle Link software suite offers industry-leading software functions and programming capability as well as access to all firmware updates and new features at no cost! Olathe KS, June 23, 2016 – Castle Creations, the leader in electronic drive solutions for unmanned aircraft systems, welcomes the new Federal Aviation Administration (FAA) regulation announced this week. The new rules will make it easier for American businesses, farmers, nonprofits and government agencies to use drones in their work. Tuesday, the Department of Transportation’s Federal Aviation Administration finalized the first operation rules for routine commercial use of small unmanned aircraft systems (UAS or “drones”), opening pathways towards fully integrating drones into the nation’s airspace. “These new regulations open up a world of exciting possibilities for not only Castle Creations, but our commercial customers as well. We are quite pleased that the FAA is forming a more accepting policy in the industry,” said Castle Creation’s President Jonathan Feldkamp. The new rule (outlined here) will become effective in 60 days, replacing the current FAA scheme that requires commercial drone operators to spend months waiting for an FAA exemption and to employ a pilot with a manned aircraft license from the FAA. It offers safety regulations for unmanned aircraft drones weighing less than 55 pounds that are conducting non-hobbyist operations. The tough regulations have been a thorn in the side of business owners for years and have made it difficult for them to take a deeper dive into the benefits of utilizing drones in the industry. For Castle Creations’ customers, it couldn’t be better timing. This week Castle Creations has released a firmware update that gives our commercial customers some much needed features such as reverse thrust and improved failure recovery technology. This will be followed by a release for FPV racers and a new platform shortly thereafter. Castle Creations continues to invest in R&D that will lead the industry for years to come. Castle Creations, Inc. is a global manufacturer that has challenged the limits of technology since 1997. 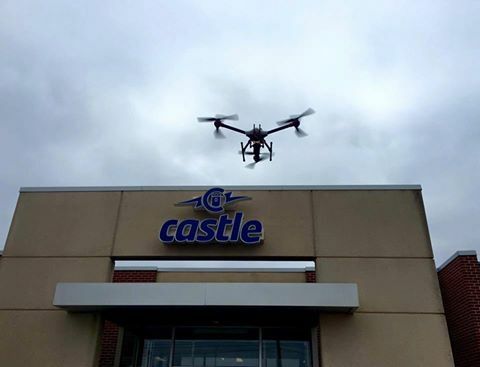 Based in Olathe, KS USA, Castle continues to pioneer high-performance electronic speed controls (ESC) and motors for the radio controlled (R/C) air, multi-rotor and car enthusiast markets as well as commercial UAV and drone markets. Our custom products continue to deliver high-performance electric drive solutions that are commonly used in motion control applications. The Castle Telemetry Links were developed based on communication protocol from Spektrum®. They become a communication module between the Castle ESC and the radio receiver and/or telemetry module where they are attached. The Castle ESC is then easily programmed through Castle Link ™ to allow the bidirectional communication required to transmit data to the radios. The ESC must have the ability to accept a bidirectional communication protocol that gives it the ability to transmit real-time telemetry feedback. This feature is called Link Live™ and needs to be enabled on compatible ESC’s using Castle Link™. Click here to view the Castle ESC Compatibility Chart. AirWare supports bidirectional communication. It is also necessary to utilize a compatible Spektrum Telemetry Module.